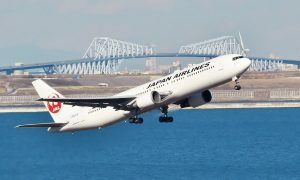 Japan Airlines (JAL) began nonstop service between Tokyo Narita Airport and Dallas Fort Worth International Airport today, reviving a route that had been discontinued in 2001. 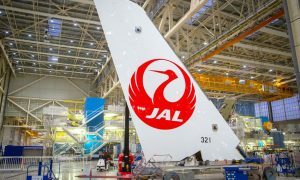 JAL will start the service with four flights per week on Monday, Wednesday, Friday and Sunday utilizing Boeing 787-8 Dreamliner aircraft, and the airline announced it plans to increase to daily service on March 20, 2016. Japan Airlines is one of the world’s leading air carriers from Japan, with hubs in Tokyo Narita and Haneda, and it is a member of the oneworld® alliance in partnership with American Airlines and 13 other carriers. JAL Chairman Masaru Onishi led a traditional Japan Airlines gate ceremony to officially send off the aircraft to Tokyo. Departing passengers were invited to take part in the gate celebration, which included traditional Japanese cuisine, entertainment and gifts. 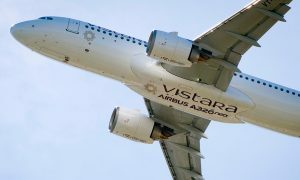 In addition to the new route, JAL shares two daily DFW-Narita flights operated by American Airlines in a trans-Pacific joint business partnership through the oneworld® alliance. Japan Airlines serves 55 destinations within Japan and another 37 international destinations in addition to DFW. With its return to DFW, Japan Airlines becomes the 14th international carrier to serve Dallas Fort Worth from DFW’s International Terminal D.
Over the past decade, DFW Airport has expanded its focus on international destinations and world-class amenities, attracting 12 new international carriers and 22 new international destinations. Today, the Airport hosts routes to 149 domestic and 58 international destinations and serves 7 million international passengers annually, an increase of more than 38 percent. DFW Airport is focused on elevating the customer experience for global passengers, with recent additions such as DFW’s Automated Passport Control (APC) kiosks for faster Customs processing, and the Airport’s patented wayfinding touchscreen displays deployed throughout the terminals. The APC system reduces Customs wait times for over 70% of arriving customers at DFW, while the digital wayfinding screens allow customers to easily find their way to more than 200 restaurants, shops, and services at the Airport.